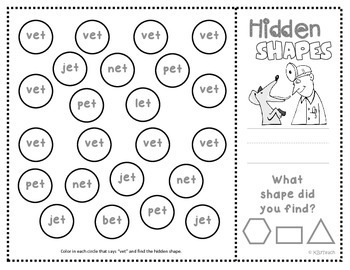 SHAPES: Find the hidden shapes in these math and phonics-based worksheets and review two skills at the same time. 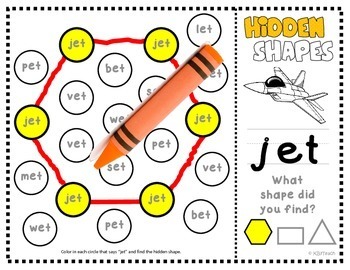 Differentiate lessons for your visual learners by using these puzzles combining geometric shapes (hexagons, rectangles, and triangles), and CVC word families (Short "E"). No prep. Just print and go! Great activities for centers, homework assignments and substitute coverage. K.G.2: Name shapes regardless of orientation or size. RF.K.2d: Isolate and pronounce phonemes in CVC Words.